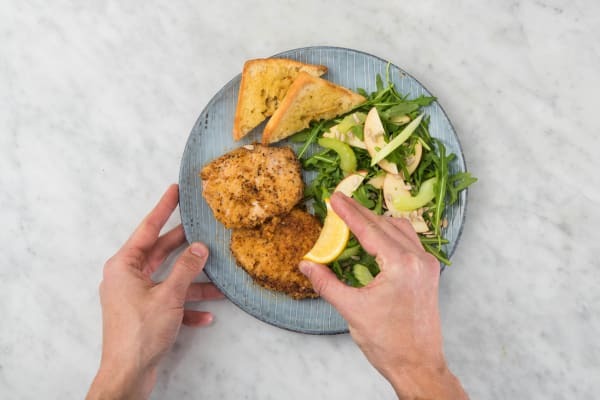 Although we can’t lay claim to the “put it in a bag and shake” method used to cook these pork cutlets, we’ll acknowledge that it’s pretty genius. That’s because it makes breading meat about as quick and easy as can be (and yes, it’s so juicy). 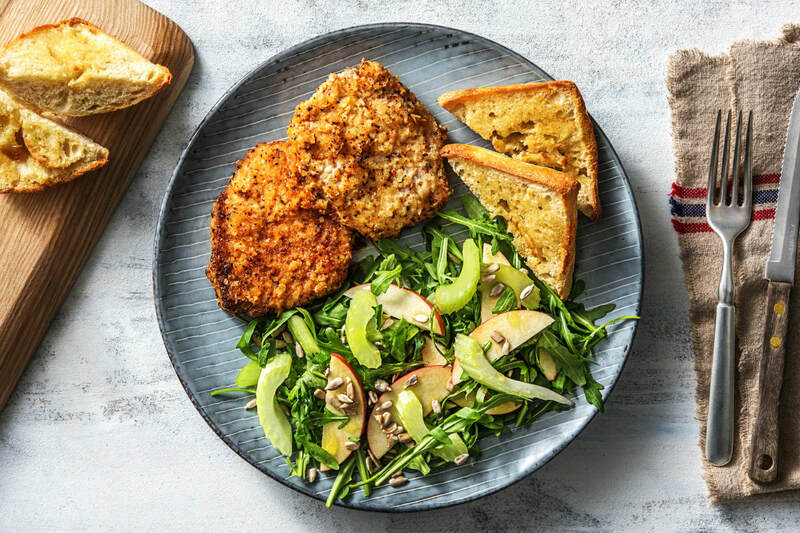 After it’s covered with breadcrumbs, the pork is fried in a pan ’til golden and served with toasted garlic bread and a crisp salad. If that sounds like a lot, fret not—this meal can be made in as little as 20 minutes. Adjust rack to upper position and preheat oven to 450 degrees. Wash and dry all produce. Mince 1 clove garlic (use other as you like). Place panko in a gallon-sized zip-close bag and season with salt and pepper (we used 1 tsp kosher salt). Place sour cream in a medium bowl, then add pork and toss to coat. 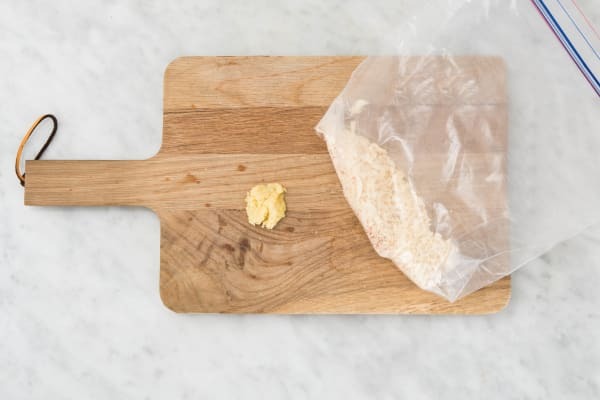 Place coated pork and fry seasoning in bag with panko and seal to close. Shake until pork is evenly coated. 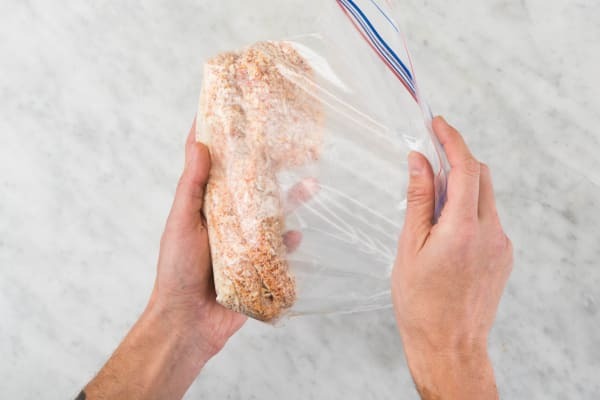 TIP: You may need to move around cutlets in bag, pressing with your hands to spread out panko and make it stick. Halve and core apple, then slice into thin half-moons. Thinly slice celery on a diagonal. Cut lemon into wedges. Split ciabatta in half (as if you were making a sandwich). 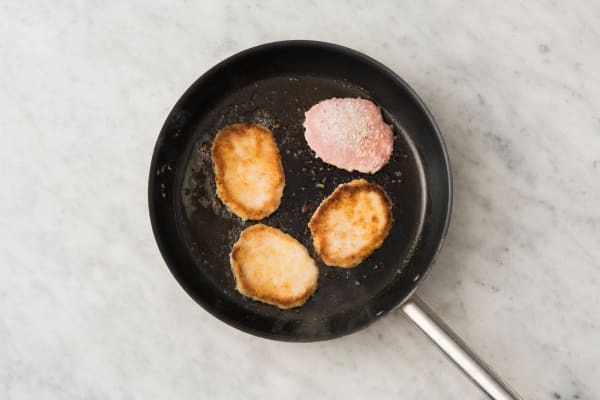 Heat a ¼-inch layer of oil in a large pan over medium-high heat (use a nonstick pan if you have one). Once oil is hot (it should sizzle if you add a breadcrumb), remove pork from bag and add to pan (discard any panko that doesn’t stick). Cook until panko is golden brown and crisp, 2-3 minutes per side. Transfer to a paper-towel-lined plate and set aside. Meanwhile, place garlic and 3 TBSP butter in a small microwave-safe bowl. Microwave on high until butter melts, about 30 seconds. 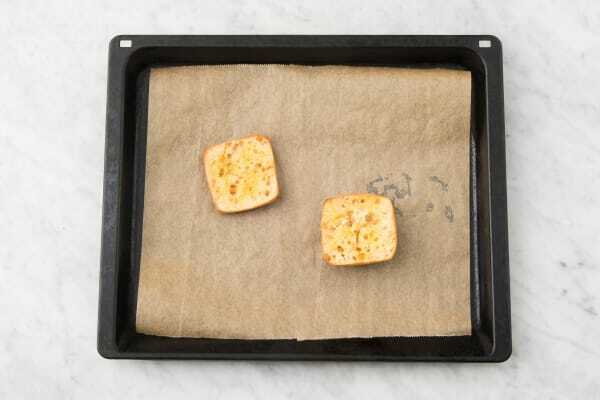 Place ciabatta halves cut sides up on a baking sheet and drizzle with butter mixture. Toast in oven until crisp and golden, about 5 minutes. Halve on a diagonal to create triangles. 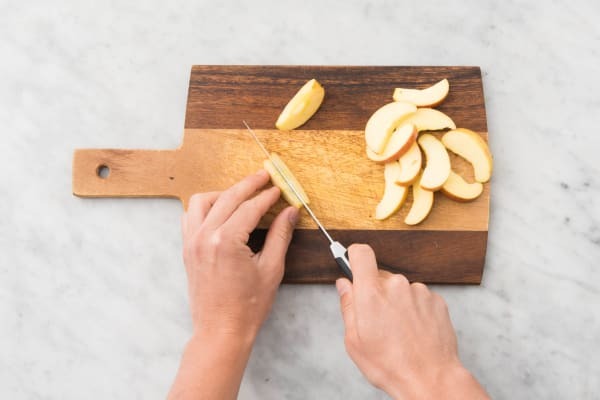 While ciabatta toasts, toss together apple, celery, arugula, sunflower seeds, 1 TBSP olive oil, and a squeeze or two of lemon in a medium bowl. Season with salt and pepper. Divide pork, salad, and ciabatta between plates. Serve with lemon wedges on the side for squeezing over pork.